30 round capacity Black Polymer Construction Made in U.S.A. Lifetime warranty from TAPCO. 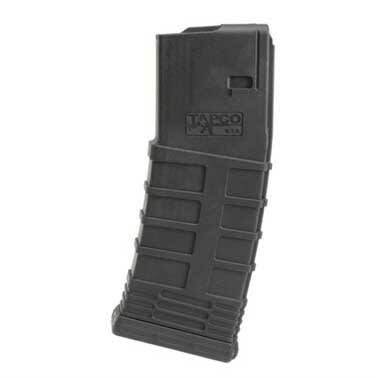 TAPCO AR-15 30 Round Magazine - Mfg #F620287 - BLACK: Tapco's Intrafuse AR Gen II magazine features a spring that is made out of premium 17-7 stainless steel and the redesigned shape makes it smoother, quieter, and easier to load. This model has a black finish.One of the finest AR-15 30 Round Magazines ever produced. Note - These come in case qty's of 100. We have price breaks at 20 pieces and 50 pieces or enjoy the most significant savings at the case qty of 100. One of the finest AR-15 / M16 mags on the market today. Extremely reliable and durable and at a great price. By collecting input from military, law enforcement, and civilian shooters, TAPCO has designed a magazine that can be depended on from a trip to the firing range to deployment overseas. Molded of reinforced composite with aggressive horizontal ridges that provide increased gripping surface for insertion and extraction of the magazine in wet or muddy conditions. This also helps to eliminate feed lip separation. The anti tilt follower has been designed to allow more dirt and grime to pass than any other magazine on the market. This allows the magazine to keep feeding ammo, despite loose dirt or sand that may have entered the magazine. The spring is made using a 1770 Stainless steel wire, featuring a unique shape for smoother, quieter loading through all 30 rounds. It also reduces overall stress on the magazine body, preventing spine cracks. 30 Round capacity. Fits All AR15, M4, and M16 Variants. Made in the U.S.A. with a lifetime warranty from TAPCO.